Finally! I knew I would eventually be able to incorporate more basketball into my blog. Now this post isn’t really travel related, but it is finance related, and 1 billion dollars is sure going better position you to travel as much as your heart desires. 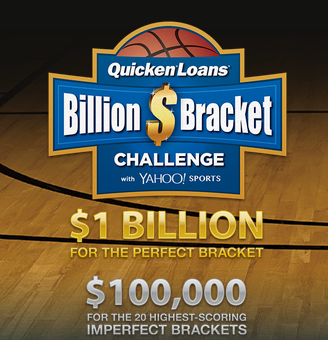 Thanks to Quicken loans and multi-billionaire Warren Buffet, they are offering anyone $1 billion dollars for filling out a perfect NCAA March madness basketball bracket via Yahoo sports. 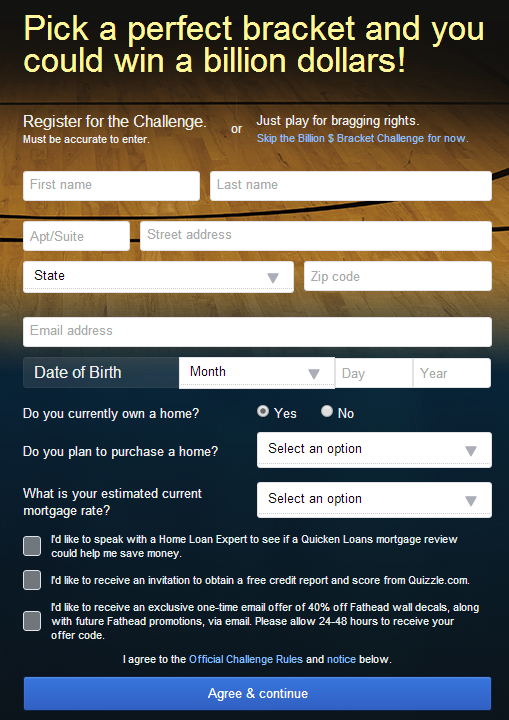 Just go to http://www.quickenloansbracket.com and fill out the information they ask for (name, address, DOB, home info) before this Thursday. Now before you go crazy filling out a bracket for everyone in your family, let’s look over the fine details of this contest. 1. No one will win the billion dollars. The odds are so slim that no one has ever had a perfect bracket filled out documented. Even in the past 7 years, there was only 1 bracket filled out on ESPN that had all of the first round picked correctly. 2. Even if you were to get the first 60 games correct, Buffet himself told the LA times he would try to buy the person out at that point. “I’m not sure Quicken would let me do that,” Buffett told ESPN.com’s Rick Reilly, but then confidently says, “If I offered you $100 million to call off the bet, I bet you’d take it,”. For the average person, a guaranteed $100 million (or even $10 million) is a no brainer over a slim chance at $1 billion. 3. Should I not even bother filling out a bracket now? Not at all, I say go for it. There are still 20 people who are going to get $100k for doing this. Sure, you trade in some personal information (which is why this is such a smart marketing tool for them), but if sports and march madness are something you enjoy anyway, why not get a potential reward from it. I will be filling one out myself, just as our president does every year now, and will be sharing it before the tournament starts this Thursday, March 20th 2014. Point2Steve’s strategy for picking winners! 1. Disregard the experts if you know nothing about college basketball. No one has EVER filled out a perfect bracket, so you’re not going to get any perfect advice. But seriously, in general stick with higher rank teams (#1 is the highest). There are always upsets and “cinderella’s”. Best of luck finding them and I hope one of my readers wins at least $100k.